File in the first post updates again. Many thanks for staying up past midnight. It seems I accidentally deleted the first post attachment earlier instead of updating. It is back up. Also, a poll. Please only vote if you' live in a right hand side country, otherwise the vote gets skewed. Fixed a slight leak of my wip sprites. Cleaned up for this new version, of which it looks all fine (the same) unlike before. (1.0d attached). [Edit] Fixed a small commenting error. When I use the latest roadset (1.0d) all of my roads are bright PURPLE!! Ok I'll go quiet now. I was using the wrong UKRoadset file. Should have used UKRoadsetw.grf. That's what I get for extracting into the Data folder without looking at which files were put there. No worries. We all make mistakes. Yes, with OpenTTD, it depends on what graphics you are using to begin with. Fantastic RoadSet! Realy good work on the pixels! The only thing is... I would like to see the "right" Version of it! Right then, it looks like I'll be making some Drive on Right roads. Many people like to make their own world. I'm sure many who use UKRS and HOVS drive on right. I've completed the right hand side sprites for all TTD climates. Now I only need to finish the Ausland and Japan landscapes! Very nice work Burnt Oa...er..Born Acorn. I've now also done left and right hand side graphics for the Japanese landscape. All that is needed now is the right side for the Ausland sprites and some minor improvements, then all that is needed is to wait for Lakie to be able to code it all. Some time in January after I go back to Uni. Most lightly after my exams though, no rush. 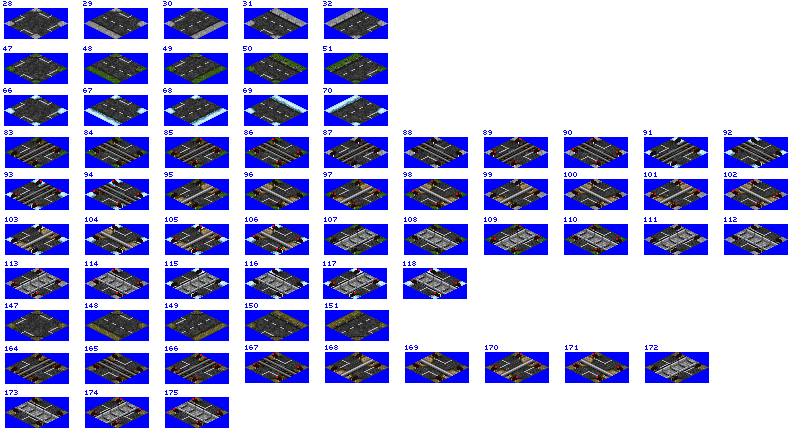 Now all I need is the other grf landscape sprites and all will be done. Please note if you change the drive side ingame, you will have to click apply in the newgrf window. File comment: Zip file containing both the Windows and DOS versions. So it is exactly the same, just reversed GFX for American folk?